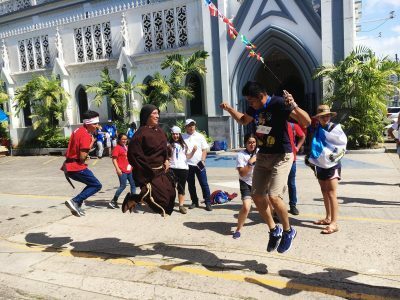 The transformation that humanity and the Church requires is in young people’s hands, the Archbishop of Panama said as he inaugurated the 34th World Youth Day with Mass in Panama City. Archbishop José Domingo Ulloa Mendieta, as Metropolitan Archbishop of Panama, celebrated the Mass that marked the official opening of WYD celebrations. He spoke about confession, holiness and sanctity, and formation. Of confession he said that sometimes adults think that young people do not want to listen, but while they need “direction and accompaniment from us”, above all they need “us [adults] to listen” to them. The Archbishop said young people are not easily impressed and search for someone who gives witness and who shows them God with their life rather than with talk. The Archbishop of Panama quoted Pope Francis who said: “We can all be saints”. He continued: “A saint defends migrants, seeks justice, prays, lives, and loves their community, is joyful and has a sense of humour, always struggles, gets out of mediocrity, lives the mercy of God, and shares with their neighbour”. Archbishop Mendieta also spoke of the special gift to the young people on behalf of the Pope: the DOCAT Book and App, which is aimed at making people more familiar with the Social Doctrine of the Church. “This is a dream of Pope Francis,” he added, “that we also want you young pilgrims to take on, because one way of dealing with adversities … is knowing the social thought of the Church, in order to make the revolution of love and justice a reality”. This is the Pope’s first trip of 2019. He departed on an Alitalia flight from Rome’s Fiumicino Airport at 09.51 (local time) and landed in Panama at around 22:30 Italian time. 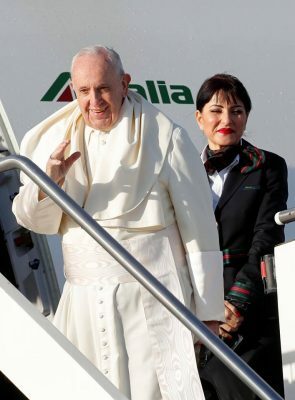 Upon arrival at Panama’s Tocumen International Airport, the Pope went to the Apostolic Nunciature, where he is staying during the visit. Today (Thursday 24th) he begins with an official welcome at the Presidential Palace and a meeting with authorities and diplomats. Pope Francis also meets with bishops from Central America. The highlight is the opening of the World Youth Day ceremony at the Coastal Belt at 17.30 local time. Up to half a million participants will be involved in the many actions and activities this week at WYD. The young people will receive rosaries made by the Christian artisans of Bethlehem. Aid to the Church in Need (ACN), a Catholic charity, has donated €100,000 towards paying the approximately 200 families who have worked for months making the rosary beads and who, with many others, are facing economic hardship. This money is the equivalent of a year’s income for them. More than 350,000 Christians have abandoned Bethlehem in the last 70 years. They work in tourism and the production of sacred items appears to be one of the few viable forms of livelihood for them.